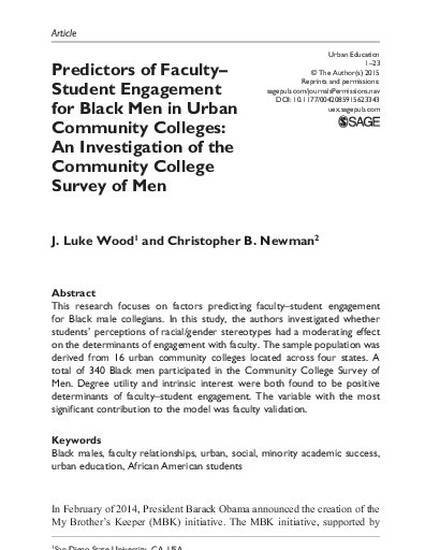 This research focuses on factors predicting faculty–student engagement for Black male collegians. In this study, the authors investigated whether students’ perceptions of racial/gender stereotypes had a moderating effect on the determinants of engagement with faculty. The sample population was derived from 16 urban community colleges located across four states. A total of 340 Black men participated in the Community College Survey of Men. Degree utility and intrinsic interest were both found to be positive determinants of faculty–student engagement. The variable with the most significant contribution to the model was faculty validation.